The session began with us presenting our counter on Article IV: Union Membership and Union Activity. The Administration’s Bargaining Team then presented their counter on Article IX: Benefits and Leaves. A great amount of progress was made towards settling both of these articles. We are optimistic that an agreement could be reached by next Friday. As a reminder, one of the things we are fighting for in Article IX is retirement access to the library system. A moment of note from today’s session was when member Dorothee Schneider, who is retiring this year, was able to better clarify the process by which retirees could access library resources. This proved a concrete example of how important it is for members to attend bargaining sessions. Dorothee understands this concern because she is experiencing this concern. There might well be parts of this contract you experience and understand better than anyone else. Be there to make sure your concerns are clear and accurate to all. Is your required workload ambiguous or ever-changing? Have you been asked to perform extra duties without compensation? Attend the next session and tell us about it. And, if you can’t make it in person, be sure to contact our Lead Negotiator, Kay Emmert, ake153[@]hotmail.com with your story. We began the session by submitting our counter on Article IV: Union Membership and Activity and Article IX: Benefits and Leaves. We answered any initial questions the Administration’s Bargaining Team had, then broke into our respective caucuses so they could form their counter. When we reconvened, they let us know they needed more time to arrive at a counter for Article IX, but they did present their counter to Article IV: Union Membership and Activity. We are encouraged by their counter, as they did make clear movement. There are a few places where more work is needed, but it seems like we are close to settling this article. If these are issues you care about, contact our Lead Negotiator, Kay Emmert, ake153[@]hotmail.com. And remember, all members are invited to see bargaining first-hand, hear the administration’s stance, and make sure we’re representing your interests. We began the session encouraged that the Administration’s Bargaining Team brought a full counter response. This means we are able to get down to serious bargaining sooner. We were also encouraged that they stated that this was their initial response, but there was room for movement. Unfortunately, their counter offer provided minimal substantive response to our concerns, in fact addressing only 1 concern: notifying faculty when their health insurance will end. All of our other concerns were rejected outright. Asking units to define full-time workloads so when faculty are asked to do extra work, it’s clear they should receive extra compensation. Any pay increases, they instead want the full power to decide later if and when faculty receive raises and how much. Multi-year contracts for the professorial track. Throughout, they expressed their desire to leave solutions to these problems up to individual faculty members. However, that does not protect individual faculty from abuses, and ignores the reason we created this union in the first place: members fighting for consistent protections and better working conditions for everyone. We hope to see more specific responses to our concerns in future sessions. For next session, both sides agreed to begin work on the articles where we see the most common ground: Article IV: Union Membership and Activity and Article IX: Benefits and Leaves. Come hear for yourself why they rejected our proposal for items like retired faculty access to the library system. All members are invited to see bargaining first-hand, hear the administration’s stance, and make sure we’re representing your interests. The session began with the Administration’s Bargaining Team presenting their counter proposal for Article IV: Union Membership and Union Activity. The majority of the session included both sides asking clarifying questions regarding the language best suited to ensure that our Union receives accurate information about our membership in a timely manner. While their counter did not address our concerns, they were explicit that there is movement on these topics, and we feel that the conversation was in a spirit of compromise and meeting a win-win situation. In response to our concerns that they did not present a comprehensive counter offer during Session 2, they have promised one for the next bargaining session, which will take place this Friday, April 5th. 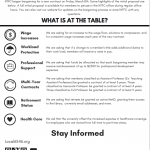 We are encouraged by this, and believe it is the best way we can meet our mutual goal of ending bargaining by this summer, as well as NTFC’s goal of reaching an agreement that best serves our membership. Remember, sessions are open to members, and we encourage you to hear their comprehensive counter offer at the next bargaining session. The meeting began on a positive note, with their bargaining team remarking on their appreciation of our work on the proposal we delivered on March 8th. They also voiced the shared goal of wanting the bargaining process to move quickly. They did not, however, come with a comprehensive response. The good news is that they have said they are not proposing any changes to the current contract. However, if we are going to move quickly, we need to have their comprehensive response. To help them arrive at one, we are meeting on Monday, April 1st to answer any questions they might have as they construct their comprehensive response.